If you are a regular reader of this blog you have probably realised that I have a bit of a weak spot for music technology. If you are like me and have limited musical talent and ability, I cannot emphasise enough how important it is for you to scout around and find new ways of making your playing appear more interesting. This can be done by a multitude of ways; some practise, some have lessons, but I just hide behind a vast array of electronics in a pathethic attempt to add colour to my guitar playing. Where is this going? Well, I am always on the look-out for new gizmos to either bring a new sonic array to my arsenal of sounds or to inspire new tunes. Last year, it was the Boss SL-20 that really floated my boat. The idea behind that pedal was to bring the “slicer” effect to the guitar, an effect that has existed for a while in synthesisers and been used predominantly in the dance music genre. It takes the sound source and cuts it into pieces and broadcasts it rhythmically, slicing it up and broadcasting a pulsing cut-up sound. It’s hard to explain further than that really. Anyway, the SL-20 was interesting to me because it also brought a level of harmonic delay to the proceedings. Harmonic delay is something that has interested me for a while. The concept is that you strike a note and the equipment is programmed to play the harmonic variations of that note. So you can instantly create a backing track for a song with just a handful of notes. 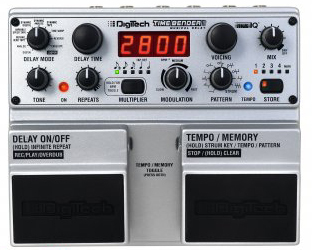 This is what attracted me to the SL-20 and then the Digitech Timebender which was advertised earlier in the year at the 2009 Winter NAMM. I’ve been waiting a couple of months for the units to hit the UK and was lucky to spot them arrived at Absolute Music Solutions last weekend, so I put my order in. Absolute Music Solutions are a preferred music sales team of mine, so I wholeheartedly recommend them. When they have the gear in stock, they have it in stock (unlike many other musical instrument webstores) and their delivery is lightning fast. Prices are good too! Anyway, the Timebender is a standard twin pedal configuration that has been championed by Boss et al. The delay side of the pedal is impecable and if you are looking for the ultimate delay pedal, it certainly gives the Boss DD-20 a run for its money. Something I noticed about the DD-20 is that it does “colour” your sound and you seem to lose some dynamic range. You don’t have this with the Timebender and everything sounds sparky and clean. There are ten delay varieties and a 20 second looper. The range of delays are great, but to my cloth-ears, I can’t always hear a difference, but you get 5 seconds max of stereo delay. The interesting part of the pedal is how you present the delay in the mix. You can have it bouncing all over the shop with a panner effect, or you can select one of the 9 auto-rhythms. Where the pedal comes into its own is with the “Strum” function. This allows you to hold down the right pedal and pick a dampened note in the rhythm you want your delay to repeat. It is frightningly accurate and you can create some great varieties of delay repeat. In fact, if you think about it, I guess it is only limited by your imagination. This Strum feature can be combined with the harmonic delay feature, which gives you 100 intelligent harmony settings to pay with. Using the MusIQ technology, you press down the right pedal again and play the fundamental note (or chord) to figure out what key you are playing in and the harmonics are generated from that. It is a great feature, but it is a bit picky. During my tests, it would throw out many wobbly notes and I am thinking that it isn’t particularly fond of the output from the Roland VG-99. Funnily enough, the Timebender harmonic function tracked more accurately with my bass and VB-99 setup. I have a feeling that the pedal likes really clean, direct output from the guitar for it to operate with optimum accuracy. I will try this later and report back here. If you don’t have a “do-it-all” delay pedal and are looking to buy into that market, then the Timebender is a must-have. However, it is limited by its five second delay and the mono 20 second looper. The Boss DD-20 has a 20-second max delay and stereo looper and its really still king of the castle when it comes to delay. But if you are intrigued by the idea of harmonic delay and can find a use for it in your recording setup, then gives this pedal a spin. The following two tracks are recorded with just a guitar and bass and the Timebender harmonic delay function. The next track is called “March of the Numpties” and ended up sounding like something off Robert Fripp’s “League of Crafty Guitarists” albums. It is a single nylon guitar with the harmonic delay panned left and right. I quite like it because it sounds ridiculous! Thanks for a great review on TimeBender. I got one as well, and I can wow for it, too. However, do you have any problems with HOLD keeping in sync? I do. When locking or freezing a groove, by pressing the left pedal down so the led turns yellow, it locks perectly at first. But after a while, say a couple of minutes it looses sync and drifts out of time, especially with different rhythm patterns. It hasn’t got anything to do with that I don’t press it at the right moment, it does actually starts to drift after while. Does yours have the same problems?